Winner of the ‘Gold Award’ at the Great Taste Awards. Great with Cheese made with Yorkshire chillies but beware. This one does have kick so be careful lots of people have tried to copy it but this is the real award winner. Heat Level = Hot. 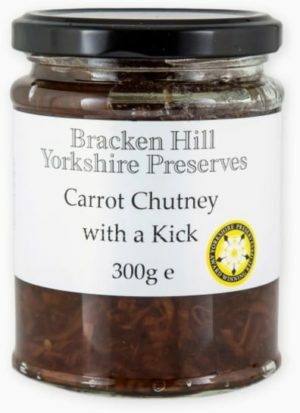 Mine and my uncle’s absolute favourite chutney so both homes have it permanantly in stock. Particularly divine with eggs. The loveliest chutney I have ever tasted . I cannot praise it enough wonderful on sandwiches ,wonderful off the spoon .So good I thought it was made in Lancashire ! As soon as my other runs out I shall be pushing the boat out and ordering at least 4 online ! Carrots 33%, Sugar 27%, Onions 17%, Wine Vinegar 13%, Balsamic Vinegar 6%, Hot Lemon Chillies 1%, Sea Salt, Corn Starch, Spices.